Our company is here to add more excitement to your special events. We offer years of experience and provide services from Suffolk to Queens County. Whether you are planning a wedding, corporate event or private family gathering, we offer a personal touch to all types of occasions. We got these guys in to do an event for us. We gave them a selection of music we liked, and asked them to bring other selections based on what we'd provided. They worked within our preferences perfectly, and their music fit in great with the atmosphere of the event. Got just the right vibe. Our guests were thrilled. Finally, a DJ that can bring an event to life - not bring it down with the usual cheesy fare. Way to go guys! Thank you! There is fun and rhythm, there is taste and a will to rock and roll. In other words, there is Li Good Times DJs. The services provided are wonderful and careful to their last detail and they make the party or event even more amazing. Everybody will dance around and have a great time and you will be happy that you made that choice of a DJ. You can take my word on that, trust me!!! My friend had a gala time during her wedding and that was all due to the wonderful services of the DJ from Good Times! My word, I’m booking this guy for my wedding! Five stars! I’m happy with LI Good Times DJ and would vouch for their claims. If you are hosting a party or an event, you’d better book them for an exciting evening. Your guests would be as enthralled as mine were. I’m satisfied with their service and cost effectiveness and wholeheartedly recommend them. At a friend’s wedding, I saw LI DJ’s at work! They had classy music hits on roll and belted out one chartbuster after another. Deftly playing a mix of rock, Gospel, jazz and classic hard metal, these men know their craft perfectly well. The result? They had me dancing! And I have two left feet! I therefore, took their numbers and hopefully, shall contact them for my birthday parties in future. 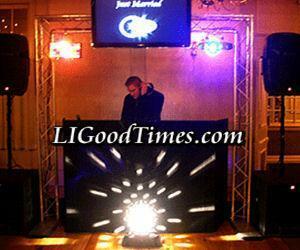 Do you have any experience using LI Good Times DJ's? If so, please rate your experience and let others hear about it using the form below.